In slightly bizarre interview, maverick Likud MK warns Bayit Yehudi not to enable a catastrophe, "through inaction and silence"
MK Moshe Feiglin (Likud) called upon the Bayit Yehudi party Sunday to consider leaving the Coalition because of the prime minister's decision to enter negotiations with the Palestinian Authority (PA), in talks brokered by the U.S.
Feiglin made the pronouncement in an interview for Galei Yisrael Radio. The interviewer asked Feiglin pointedly if Likud voters voted for Prime Minister Binyamin Netanyahu, who has announced that he is entering talks with the PA, or for Feiglin and the MKs who oppose the "peace talks." 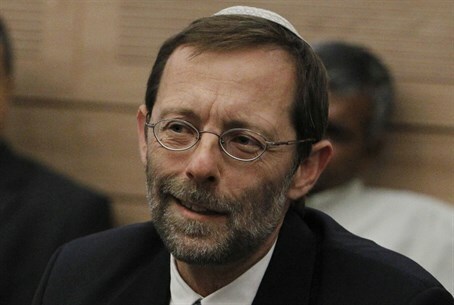 The interviewer asked Feiglin if he is calling upon Bennett to leave the Coalition. “I think that in the face of the reality that is approaching us, we certainly need to consider a possibility like this, too,” Feiglin replied. “I remind you that ever since I was forbidden from entering the Temple Mount, I announced that I see myself as being unbound by coalition discipline. I am already there and I am calling upon Bayit Yehudi to start considering similar activity. This is a disaster that is certain to happen. We know exactly where these processes led us, again and again, in the past, it is too bad that the Bayit Yehudi party, through inaction and silence, will allow this catastrophe to take place. Feiglin said that he does not expect anyone to leave the Coalition soon, but estimated that as the situation becomes worse, public pressure will make the breakup of the Coalition a realistic possibility. The maverick Likudnik's call may seem slightly strange given his position within not only the same government, but the very same party as the Prime Minister whose policies he is calling on Bayit Yehudi to thwart. However, it can likely be viewed through the prism of the colorful political rivalry between Feiglin and his "Jewish Leadership" (Manhigut Yehudit) faction within the Likud, and the religious Zionist Bayit Yehudi party. There was considerable competition before the last elections between supporters of Feiglin and those of Bennett. Both camps see themselves as dyed-in-the-wool nationalists, and many of the supporters of both men are religious Zionists. Instead, the differences between the two factions stems from their respective political strategies. While Feiglin believes in making a difference from within Likud party which has dominated the Israeli political scene for so long, Bayit Yehudi supporters believe more influence can be wielded from outside of it. Both men are currently inside the Coalition, and as "peace talks" progress, they will doubtless feel mounting pressure to leave it.